Camp for €16,- a night at Kamp Jelincic in low season with CampingCard ACSI. 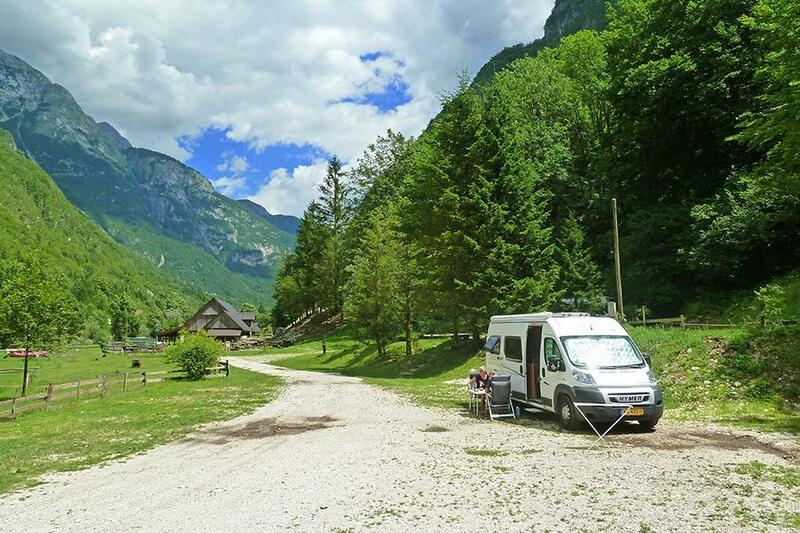 Kamp Jelincic, located in Soča, is a campsite with 50 touring pitches. With your CampingCard ACSI you can camp on one of the pitches during the following periods: 01-04-2019 - 15-06-2019 and 01-09-2019 - 31-10-2019. At this campsite you can not only use your CampingCard ACSI for inexpensive camping, you can also use your ACSI Club ID (as an alternative ID). Campsite on rural sheep farm directly on the Soča river in Triglav National Park. Hostel restaurant with local specialities. Panoramic view of the mountains. Many day trips possible in this beautiful area. Site has a dog training field. Would you like to book Kamp Jelincic or request more information? You can do both using the information below. North side Bovec exit Trenta Kranska Gora approx. 1 km north of Soca village, directly behind campsite Korita (signposted). Route via Kranska Gora not for caravans. Larger caravans via Udine Cividale (IT). CampingCard ACSI will send your information request to "Kamp Jelincic".